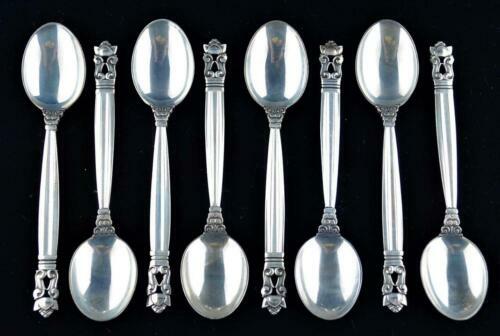 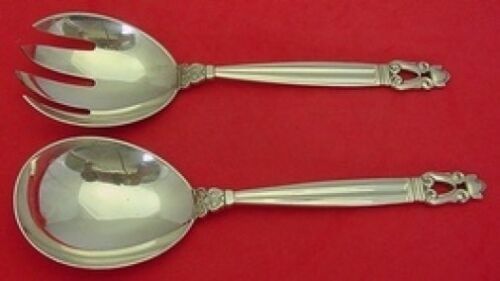 $19.99 (1 bid) 5 Vtg 1947 Rogers Bros XS Triple Silverplate Teaspoons Acorn Pattern 6"
$229.0 Georg Jensen Acorn Sterling Silver Salad Serving Fork - Hammered Style - 9-1/2"
Buy: $324.0 georg jensen acorn sterling 4pc place setting,purchased early '50s, 12 avail. 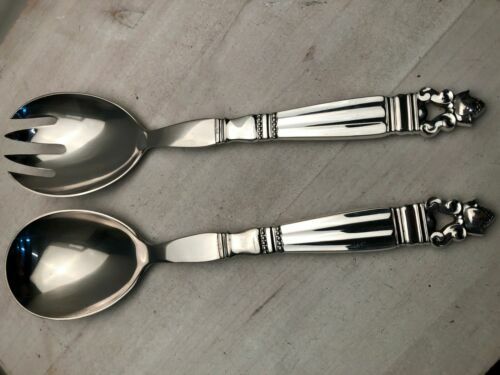 $389.0 Acorn by Georg Jensen Sterling Silver Salad Serving Set 2pc HH w/ Steel 9 1/4"
$395.0 Georg Jensen Acorn All Sterling Silver Handled Salad Serving Set w/ Mono 8-1/2"
$135.0 GEORG JENSON ACORN SALAD FORK AND SERVING SPOON 8” NO MONOGRAM.!! 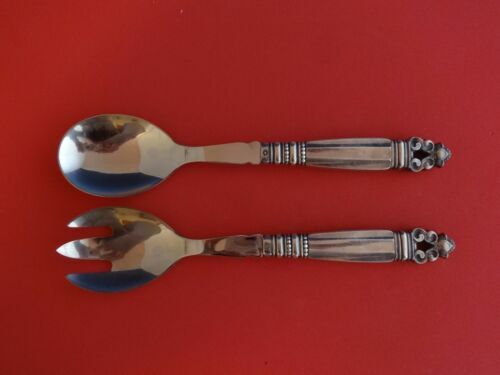 $309.0 Acorn by Georg Jensen Sterling Silver Salad Serving Fork 7 3/4"
$359.0 Acorn by Georg Jensen Sterling Silver Salad Serving Set 2pc with Steel 8 5/8"
$185.0 Pair of Georg Jensen Denmark Acorn Sterling Silver Salad Forks 5 7/8"
Buy: $275.0 Acorn by Georg Jensen Sterling Silver Salad Fork & Spoon Set w/ Steel 9 1/4"
Buy: $650.0 Vintage Set Of 12 Sterling Silver Georg Jensen Acorn Cold Cut Fork 2 Tine 6 1/2"
$609.0 Acorn by Georg Jensen Sterling Silver Salad Serving Set 2pc FH All Sterling 8"
$295.0 Georg Jensen Denmark Acorn Pattern Large Serving Spoon and Fork Set 9.5"
$585.95 Acorn by Georg Jensen Sterling Silver Dinner Knife Long Handle 9-1/8" No Mono.! 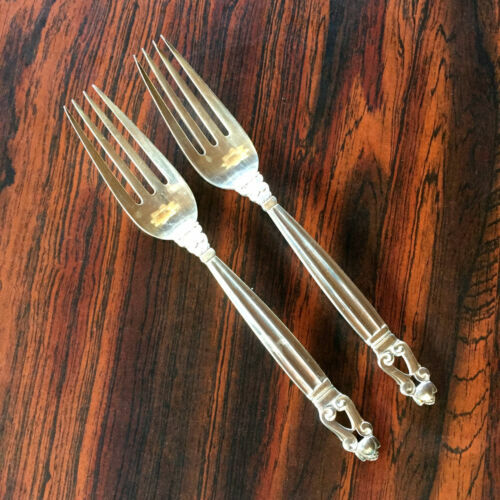 $275.0 Rare Large Georg Jensen Denmark Acorn Sterling Silver Meat Serving Fork 9"
$209.0 Acorn by Georg Jensen Sterling Silver English Server Custom Made 6 5/8"
$709.0 Acorn by Georg Jensen Sterling Silver Salad Serving Set 2pc FH AS 9"
$289.0 Acorn by Georg Jensen Sterling Silver Salad Serving Set 2pc HH WS 7 3/4"